NOW SERVING – SHAKESPEAREAN OMELETTE WITH INDIAN CHUTZPAH ! A successful director, a yet-to-prove-himself actor & a Kashmiri journalist as the script writer along with generous support from Shakespeare, have combined to create a critically acclaimed but controversial Bollywood flick – “Haider”. “Haider” is an adaptation of the Shakespearean classic- Hamlet. Set in the militancy ridden Kashmir of the 1990s the plot has betrayal, love and revenge intricately woven together. Adapting it to Kashmir in a particular period is a challenge well met. Revolving around the revenge that the wronged son seeks for his father’s betrayal and death, from his uncle, the lead characters Shahid Kapoor (Hamlet), Tabu (Queen Gertrude), KK Menon (Uncle Claudius), Irrfan Khan (Ghost), Shraddha Kapoor (Ophelia) have rendered power packed and committed performances. The ability of Vishal Bharadwaj,the Director, to get the best out of the cast is amply showcased as well. It’s a satisfying finale for Bharadwaj, as with “Haider”, he has successfully (commercially as well) completed his Triology on Shakespearean plays – Maqbool (Macbeth) & Omkara (Othello) being the other two. “Haider” portrays the rigours of daily life in a strife torn Kashmir way back in the 90s.Its setting and the depiction of the Indian Army’s (IA) role in the conflict in light of the sequence of the destruction of the house while smoking out militants, alleged custodial disappearances as also the supposed torture methods has tended to portray the Army in a negative and controversial shade by the script writer,Basharat Peer. Some have even lamented that the Indian government “imposed 41 cuts” on “Haider”, through the censor board. Well, 35 of those have been imposed by Bharadwaj himself for getting the length right! I think the next project that these India baiters and conscience keepers should take up can be a flick on the strife torn areas under the Islamic State (IS), where they will be filming as embedded journalists (without bullet proof jackets- BPJs) and depicting the barbaric nature of the IS fighters and their excesses. The IS has kindly consented not to cut the film short through its censor board (unlike the Indian government!). Instead they have decided to cut a head from the production unit each time they find something objectionable. So, Basharat, Vishal & Shahid would you like to take this on? No censor board.Liberal enough, right? And why no BPJs? Because the IS made up its own deficiency – so to hell with the film unit! Okay I made a difficult offer. Why not film in Swat on the dangerous liaison between the ISI and the Taliban. An issue worth taking up( like the supposed excesses of the IA). FYI, Geo TV tried this and their license was withdrawn and offices ransacked ! So, game for it? No?…..Why? After all no censor board, just the Taliban and the ISI…AND YOUR LUCK! By the way a word about the Pakistan Censor Board. They banned Ranjhana as it showed a love story between a Muslim girl and a Hindu boy (?)! Then they banned Khiladi 786 as the use of the number could hurt religious sentiments (??). Banned Chennai Express as it was against the business interests of the Pakistani film industry (???). And also Agent Vinod because…wait…well that wasn’t way off the target and their Indian counterparts should have done it for the sheer torture it inflicted on the audience!!! I have a few themes in mind too. To begin with, an Indianised Charlies Angels as “Subramaniam Swamy’s Angels” starring Jaylalita, “Madame ” Gandhi and our very own Mr Kejriwal. Then “The Wolf of Raisina Hill” directed by Kapil Sibal designed to expose the guile and cunning of one man who has jettisoned the Grand Old Party into outer space. Adaptation of “Hum aapke hain kaun” to have a climax in which the dog (as in the original) entrusted with handing over the letter of support from the Shiv Sena (Madhuri Dixit) to the BJP (Salman Khan) mistakenly hands it over to the NCP (Monish Behl).Unlike the original there would be no union between Madhuri & Salman but Monish will do all he can to keep Salman away …oops..confusion…to keep the Shiv Sena away!!! Not too sure if these will pass the Censor scrutiny though. 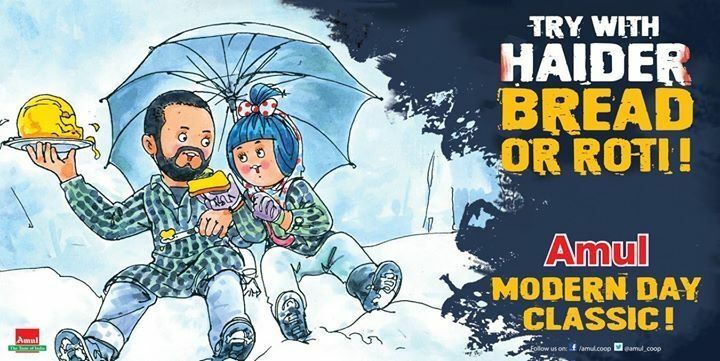 The Amul ad/ topical on the movie Haider depicts a scene from the movie with a caricature depicting Shahid Kapoor’s character sitting in the snow with the Amul Girl filling in for Shraddha Kapoor’s character. The detailing is good with the protagonists being shown in the same attire as in the movie complete with the chequered kurtas ,the pink scarf, the umbrella and the facial resemblance. The Tag Line….Try with Haider Bread or Roti…is clever play on the ubiquitous acceptability of the Amul butter with any kind of bread or roti (flat bread)as well as on the name of the movie itself. The Punch Line.. A Modern Day Classic…is a subtle way of showcasing the quality of the Amul butter by using the expression that can best describe the cinematic effort that went into creating a critically acclaimed movie. Lastly, to those who have felt aggrieved at the negative depiction of the IA, be rest assured it’s an institution with intrinsic strength and cannot be swayed by its depiction in a movie. The IA’s actions are there to speak for itself. It is one of the few armies which has not hesitated in taking the harshest actions against its own in order to right a wrong. In a conflict there are many situations when shades of grey emerge, but over time the IA has been able to discern through these too and made sure that its impartial and just image and ethics are upheld at all times. By the way, the Lion King too was an adaptation of the “Hamlet” (Simba=Hamlet & Scar = evil uncle) and Lion King II…an adaptation of “Romeo & Juliet“! Shakespearean omelettes always taste good and to make them better add some Chutzpah…yes you can..in India.Other places?Well…they may shoot first and that too to kill !!! 3rd February 2015;In the recently announced 60th Filmfare Awards 2015 winners list saw the Bollywood movies ‘Queen’ and ‘Haider’ sweeping the field with a whopping six and five awards respectivley. The Amul ad/topical on the Filmfare Awards shows the Amul Girl with the runaway winners of this year’s edition.It shows two caricatures depicting Shahid Kapoor in a tuxedo as he wore on the awards night and Kangana Ranaut in her famous “girl-next-door” attire in the movie “Queen”.They are both shown holding the “black lady” which they have won for the Best Actor and Best Actress roles respectively. The Tag Line is in the form of call out boxes with the Amul Girl making an overt attempt to let the readers know about the identity of winners in terms of the movies and the actors themselves.They translate into “Haider-tea is here” and “Kangana-have a bun”. The Punch Line…Always in a Leading Role…is a take on the awards won by Shaid and Kangana for their leading rooles in the two movies discussed above and once again subtly promotes the leading status of Amul Butter and the brand in general. Queen is a 2014 Bollywood comedy-drama starring Kangana Ranaut and Lisa Haydon and Rajkumar Rao in supporting roles. It is directed by Vikas Bahl and produced by Anurag Kashyap and Vikramaditya Motwane. The plot revolves around Kangana playing the lead role as Rani, an under-confident girl who suffers as her fiancee calls off the wedding at the last moment.Shocked and hurt,Rani decides to proceed alone on her pre-arranged honeymoon.Here she rediscovers herself in the company of staranger.She eventually returns with her fears conquered and inner demons exorcised for good.The fiancee ,Vijay, also learns his lessons when he attempts to make amends. The movie premiered at the Busan International Film Festival,had received wide critical acclaim for its unique story line,writing,direction and Kangana’s performance.Produced at a cost of Rs 12.5 crores it earned Rs 98 crores at the box office.Previously nominated in 13 categories at the Screen Awards it won three of them including Best Film and Best Director.At the Filmafare Awards 2015 the movie won six including Best Film, Best Director, Best Actress for Kangana Ranaut,Best Editing, Best Cinematography and Best Background Score. ‘Haider’ was a close second with five awards including Best Actor for Shahid Kapoor , Best Actor in Supporting Role (Female) for Tabu, Best Actor in Supporting Role (Male) for KK Menon and also for Best Costume and Best Production Design. The Filmfare Awards are the Oscar Awards equivalent for Bollywood and have had its share of controversies and ups and downs.These have been attacked for their poor or biased choices in the past but off late have been able to make justified choices more often than not.